Q is a slick, stylish and challenging precision platformer where you roll and jump your way through its deadly neon-filled levels. In Q you control a glowing little square as it makes its way through a beautiful neon world that’s filled with deadly hazards. You can roll (albeit slightly awkwardly because you’re a square), jump and wall-jump as in most platformers, but you also have a handy ability to roll a little bit after hitting a wall (allowing you to scramble up it a little). Each level is short and satisfyingly challenging, requiring precision and skill to make your way through them, but never feeling as rage-inducing as the likes of Super Meat Boy. The current build of Q takes around 15 minutes to play through (or more if you fancy searching for the collectables). 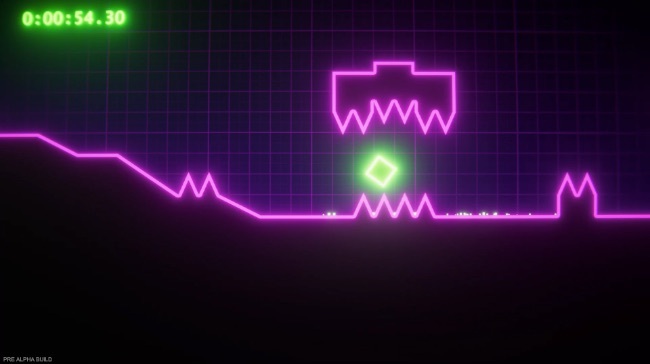 Other than the ability to scramble up walls, gameplay-wise it doesn’t do much differently from a traditional precision platformer, but the level design, the fluid controls and the beautiful neon-filled aesthetics makes for a very impressive package. A very stylish and well made platformer that’s more about challenging the player rather than infuriating them.